The GOLD PRICE backed up 50¢ to $1,115.60. SILVER lost 22.4 ¢ to $14.216 on Comex. Both silver and GOLD PRICES are undergoing a correction of that last leg up that took silver from $13.73 to $14.59 and the gold price from $1071.1 to $1,138. This is routine action. The price of gold proved that with a test today of that old-high resistant at $1,113. Made a low at $1,110.20 and came right back. Possible to get a test back to $1,100, but I don’t think so. If so, ’twill come tomorrow. Next week should be an upweek, or I’m all wrong about gold, a genuine possibility always. Suspicious side of me wonders how much the Nice Government Men had to do with the London fix glitch today, but it matters not. 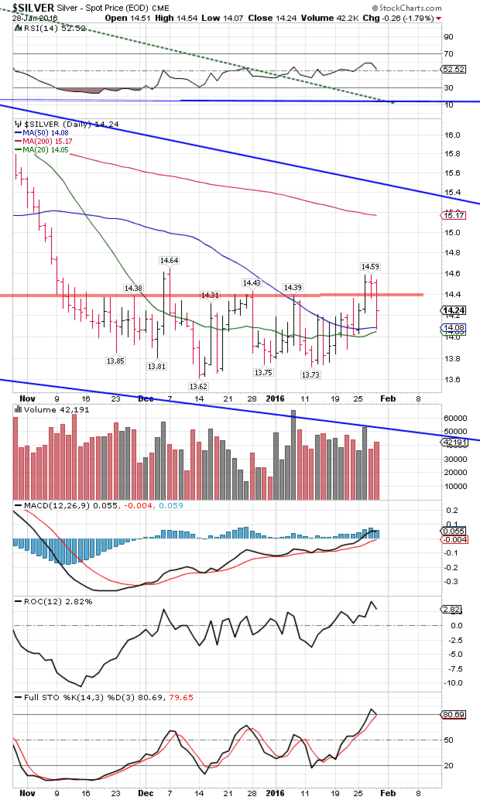 In spite of everything silver still touched its 50 DMA at $14.08 and bounded to life, proving it sinew. 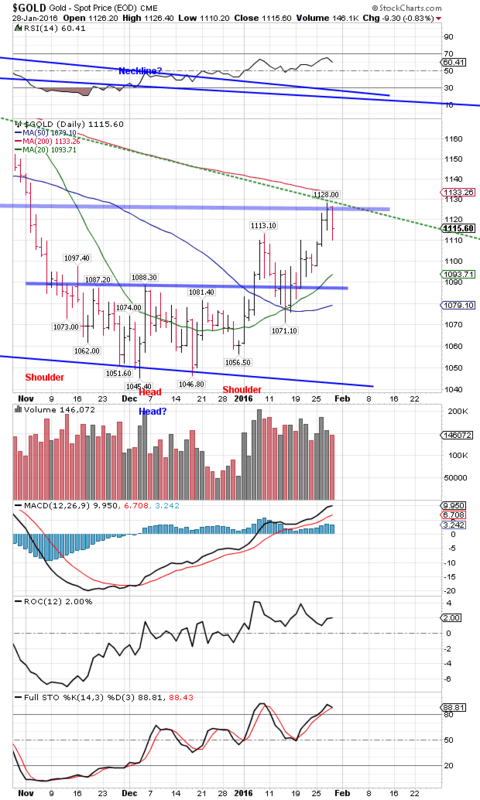 Silver and gold prices are putting finishing touches on big rounding bottoms. 2016 is shaping up to be a great year for silver and gold. GERMANY is speeding up its Bring-Home-The-Gold program which since 2013 has repatriated about 366 tonnes. This year the Bundesbank moved 210 metric tons of Gold back to its Frankfurt vaults, 100 tonnes from Paris and about 100 tonnes from the New York Federal Reserve. LONDON SILVER FIX was resurrected a year ago August when most of the former price-fixers, under pressure from ongoing corruption investigations, bowed out. CME, which gobbled up all the commodity exchanges in the US, and Thomson Reuters got the contract from the London Bullion Market Association (LBMA) to work the fix. The price is set daily by HSBC, JPMorgan Chase, Mitsui, Bank of Nova Scotia, Toronto Dominion Bank, and UBS — the Usual Suspects. On 28 January 2016 the fix was set at $13.58, 84¢ (6%) BELOW market at that time ($14.42 in London and $14.415 on CME). One commodity strategist said this could be the end of the fix, thanks to the huge discrepancy. Par for unresponsive government and bloated corporations, the CME makes no apology or comment, but it is reported the matter is being “investigated internally.” Stay tuned for further bogus explanation. COMEX GOLD STOCKS are stored in Comex approved warehouse as “eligible,” i.e., in the depository but not available for delivery against a futures contract, or “registered” i.e., “available for delivery to settle a futures contract.” In a Zero Hedge article at http://bit.ly/1nB84HU we are told that on 25 January 201,345 oz of Registered gold was shifted by its owners request into Eligible, reducing Registered gold stocks from 275k to 74k oz. That makes the “coverage ratio” — total gold claims divided by available stocks — shoot up. 40 million oz of gold open interest is “backed” by a record low 74,000 oz of Registered gold, 542 oz paper claims to every physical oz. Sorry, but it ain’t a problem till it’s a problem. The vast majority of futures contracts are settled by buying the opposing paper contract, not taking physical delivery. That’s what a futures market is for, hedging. Transitory changes like this may OR MAY NOT signify a physical shortage. If a shortage exists, futures will speedily show it in a “backwardation” — the price of gold for immediate delivery (spot month) will rise above the normally higher priced future contracts. Preliminary last prices on Comex today show a very slight backwardation not with the spot months but from April at $1,113.50 to June at $1,112.9. August is trading normally at $1,120.60. So y’all don’t panic just yet. Wait till Wednesday. I am taking a two day vacation with my surgery-recovering wife, Susan, to friends in deepest North Tennessee. Hence I won’t be sending a commentary tomorrow. However, the scoreboard today pretty well tells the tale. Stocks, although they’ve traded much higher with triple digit days, couldn’t keep any of those gains (sorry, Nice Government Men, y’all tried) as their bull transmogrifies into bear. 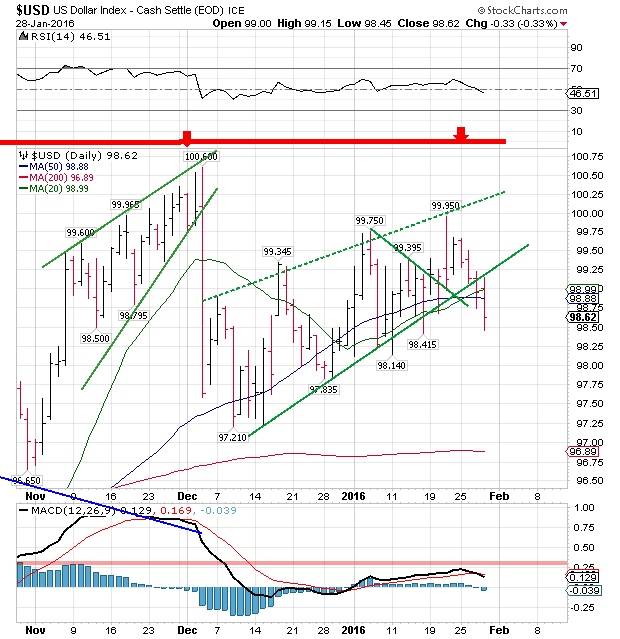 US dollar index is weak and watered as Bourbon Street whiskey, about to fall, while silver and gold prices, accompanied by platinum and palladium prices, are working up through resistance. Stocks added 130.73, 0.82%, to 16,075.19, same place they’ve stopped before trying to catch a ride higher — and failed. S&P gained 13.32 (0.71%) to 1,896.27. Stocks are staging the most lethargic rally possible. Yes, they will probably move a little higher, maybe to 16,600 and 1,950. Their day has passed. Y’all need to sell off stocks before you get caught in the generalized slaughter. But, thunderation! Don’t pay me no mind, I’m no more’n a nat’ral born durned fool from Tennessee no way. Y’all keep on lissenin’ to them Wall Street smarties. They’ll keep talking to you, long as you got money left. Euro — brace yourself — has actually broken out upward. Rose 0.44% to $1.0940, if it can keep it up. Yen fell 0.12% to 84.17.